Quilt Ambition 2.0 has 201 stitches, bobbin thread sensor, large touch screen, 4 fonts, free motion sewing, IDT system. 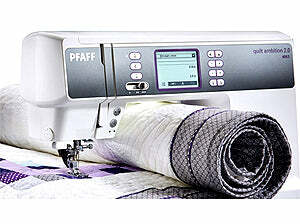 Pfaff Quilt Ambition 2.0 Sewing And Quilting Machine. Absolutely even fabric feed from both the top and bottom. 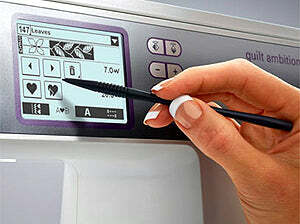 The IDT System is ideal for the quilter and sewist! Built right onto the machine, it can be easily engaged or disengaged as needed. 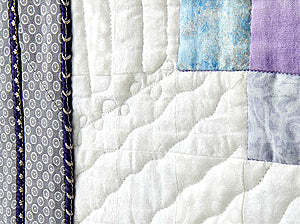 Pfaff Quilt Ambition 2.0 Features. Two special quilt feet included. The perfect feet for your quilting needs; Open toe free-motion foot and 1/4-inch quilting foot for IDT system. Pfaff Quilt Ambition 2.0 Included Accessories. Blindhem foot 3 with IDT system. 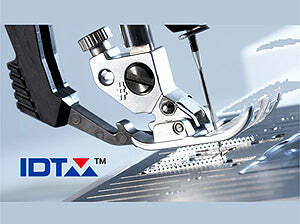 1/4 Inch quilting foot with IDT system. Pfaff Quilt Ambition 2.0 Stitches. 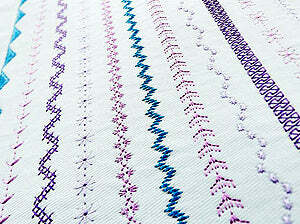 A wide variety of 201 beautiful 7mm stitches, including utility stitches, buttonholes, decorative stitches, quilt stitches, cross stitches and hemstitches. Pfaff Quilt Ambition 2.0 Information.